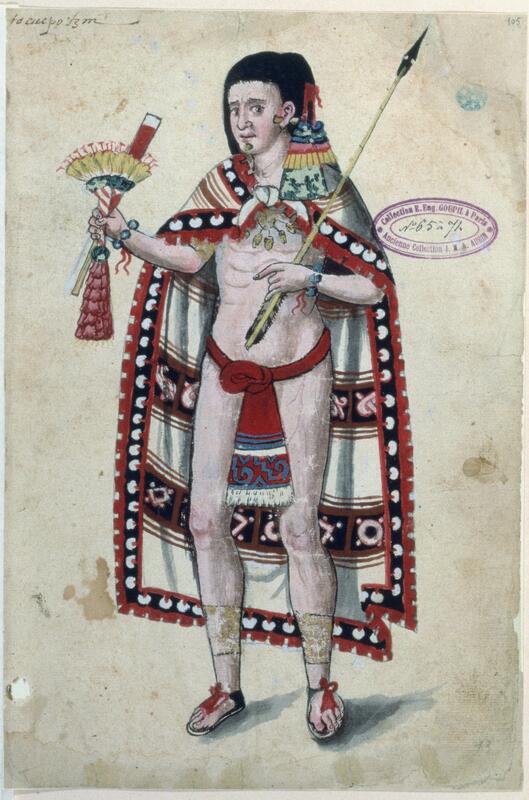 This figure of an Aztec noble, from a colonial manuscript painted in New Spain, emphasizes his elaborate regalia. His cape represents one sign of high status. Other accoutrements evoking his social position include his jewelry, gold anklets and feathered hair ornaments. Set against a blank ground, the noble appears today as part portrait, part specimen. At the top of the page, the noble's name is given as Tocuepotzin. He wears a distinctive cape, with a woven design of stripes, and a decorative fringe made of cut and polished discs of shell, an example of a high-status Aztec garment. At his wrists are blue-green stones threaded into bracelets. Their material may have been turquoise or jade. Both stones were highly valued among the Aztec, in part because their blue-green color signaled preciousness and abundance. In one hand he carries a bouquet of fragrant flowers, and in the other a long arrow, perhaps to demonstrate the military prowess that Aztec rulers needed to command. Off of Tecupotzin's elbow is a collector’s stamp which was added to the image almost two centuries after the painting was made. It names E. Eugène Goupil and J.M.A. Aubin, two Frenchmen who owned this manuscript. The painter’s name is no longer known. 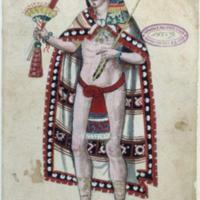 The image is part of a manuscript once owned by don Fernando de Alva Ixtlilxochitl (ca. 1578-1650), a mestizo descendent of nobility from the pre-Hispanic state of Texcoco, a kingdom closely allied with Tenochtitlan. It is for him that the whole codex is named. The painter has used colored pigments on European paper. Holes and stains in the paper evidence its age. The manuscript page measures 31 x 21 cm (ca. 12 x 8.5 inches). Sketch lines later covered over in white can still be seen, as near the noble’s bouquet and the base of his cloak. This reveals the painter’s working method: a drawing was first made, finalized in black ink and then hand-colored. At the most basic level, this image of a pre-Hispanic noble, painted at least three generations after the fall of the Aztec empire, demonstrates that memories of the kingdom remained alive. Because this painting draws upon earlier pictorial and written descriptions, it is also suggests an interest in reworking and rerecording Aztec history—especially among descendents of the indigenous nobility in Mexico.